Welcome to Bali and welcome to Sanur Bali Beach. Sanur Beach is in the city of Denpasar, precisely in the tourist area of ​​Sanur in the district of South Denpasar. The distance from the center of Denpasar is approximately 6 km, which can be reached for 10 to 15 minutes drive. While the duration of travel from I Gusti Ngurah Rai Airport is approximately 25 to 35 minutes drive via normal route, if we drive via the new toll highway coul be around 20 minutes. To make it easier to find, Bali Sanur Beach is located between 2 beaches, namely Segara Ayu Beach – Sindhu Beach (on the south side) and on the north there is Matahari Terbit Beach. To be able to enter the Sanur Beach tourist attraction in Denpasar – Bali, visitors can drive via Jl. Hang Tuah or you can also take a walk next to the Inna Grand Bali Beach hotel, because Sanur beach stretches for 3 km through the hotel. Along Sanur beach we can find many hotel, villa and homestay, the atmosphere is more quite if we compare to Kuta Beach, we have many Olden Tourist love to stay here as they can relax on the beach and enjoy drinks, swimming, so wonderful life holiday. As you stay at Canggu area, we will take you drive via Denpasar city, Renon and parking at the front of Ina Grand Bali beach Hotel, our Bali best driver will stand by around the beach, and let you enjoy your lazy day at Sanur beach. In the Raja Kasari Warmadewa Inscription (917 M, in the palace at Singhadwala), Sanur beach is described as a beautiful beach. The inscription is currently in the Blanjong area, which is south of Sanur Beach. During the Dutch colonial era, Sanur Beach became the landing place of the Dutch army when it attacked the Kingdom of Badung, which at the time was very rebellious to the colonial government. The war on 18 November 1906 was known as Puputan Badung. Sanur Beach became famous as a tourist attraction in 1937, when a Belgian artist named A.J. Le Mayeur painted the beauty of Sanur Beach and exhibited it to other countries which eventually made foreign tourists start to enliven this beach. The Belgian artist married a well-known Legong dancer from Bali named Ni Nyoman Polok. Ni Nyoman Polok is often used as a model in A.J’s paintings. Le Mayeur about the beauty of Sanur Beach. The painting studio has now become the Le Mayeur Museum which is open to the public. Visitors who come to Sanur beach can stop by the Le Mayeur Museum for a moment to enjoy the beauty of Sanur beach on the painting from olden time and read the history of the painter past life. Sanur Beach Bali is a beach that has been popular for a long time, even more popular than Kuta Beach in Badung regency. 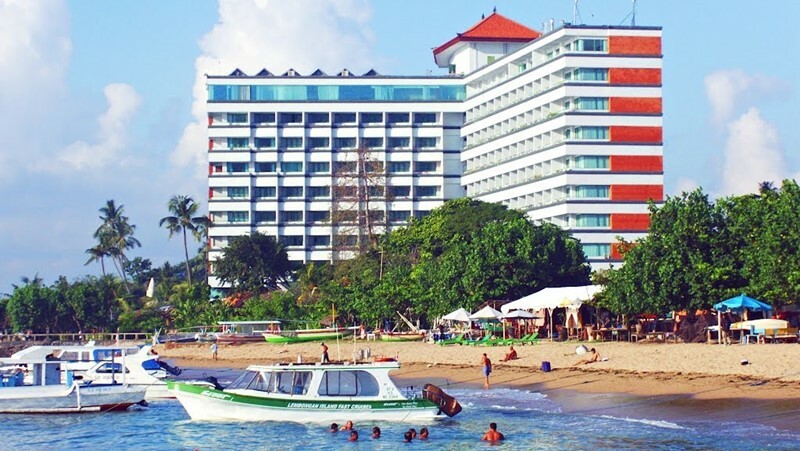 Even the first star hotel in Bali was established close to Sanur Beach, namely Inna Grand Bali Beach Hotel. This shows that Sanur Beach has a lot of interesting things that can make local and foreign tourists very interested in visiting this beach. Sanur Bali Beach is a beach facing east,so visitors can enjoy the sunrise from this beach. Many beaches in Bali are facing east, but only beaches in the tourist area of ​​Sanur, is the most visited by tourists and local to enjoy the charm of the sunrise. In the morning at around 5:30 a.m., the visitors began to visit and waiting one of the best sunrise spots in Bali, take pictures or just sit back and enjoy the sunrise moment is one of the nice experience if you are in Bali. Sanur Beach water os tends to be shallow with calm waves and there are quite a lot of rocks, it makes Sanur beach unlike Kuta beach suitable for surfing, but more suitable for swimming and diving. Tourists who come to Sanur Beach are also more courageous to invite their young children to play water or swim here. That’s why Sanur Beach is the right beach to be visited by visitors from various age categories. The calmness of the sea does indeed make visitors unable to surf on this beach, but instead it is more suitable for canoeing, diving, snorkeling, swimming, banana boating and carrying out seawalker activities and other activities. If you want to try like canoeing, you can find easily from the local, ask them the best rental rate. Visitors on Sanur Beach Bali usually packed the beach starting in the morning.Sand on Bali’s Sanur Beach includes white sand but with a slightly rough texture. This is caused by the presence of coral reefs that grow off the coast, which will crash to the beach when these coral reefs die. This dead coral reef and crashed into the beach is what forms the sand on Sanur beach. Even though it is rather rough, the sand on Sanur Beach is still comfortable to walk on it with bare foot. Another attraction is the presence of colorful fishing boats (jukung in Balinese) which are often found on the shore. Colorful boats in the setting sun make Sanur Beach always interesting to be visited by photographers in the morning who want to get the best photos. The existence of several gazebos located jutting into the ocean adds to the beauty and uniqueness of the photos produced by photographers while taking pictures on Sanur Beach. During the day or sunny day, there are shady trees on the shore of the beach where visitors who do not want to sunbathe, they can shelter under it. Sitting on the beach sand and under a shady tree at the time of the sun stinging is one of the many activities carried out by visitors on Sanur Beach. Visitors can also enjoy a variety of snacks that are sold on this beach such as roasted corn and spring rolls, wanna try it while sitting under the shady trees? What you can do at Sanur Beach ? Number one as the beach face to east, it is the right spot to See the sunrise .This is the most favorite activity of visitors to Sanur Bali Beach, which makes Sanur Beach always flooded with visitors in the morning. When the weather is sunny, come to Sanur Beach from 5 – 6 am to watch the sunrise. Visitors can do this by sitting on the beach sand or sitting on an existing gazebo. The view of the sunrise when the sea water recedes and the presence of jukung (boats) that adds to the lively scenery will always be the target of photographers on Sanur Beach. There is a long jogging track on Sanur Beach, which connects Matahari Terbit Beach to the north to Mertasari Beach in the south, which of course also passes Sanur Beach, Segara Ayu Beach and Sindhu Beach. This jogging track takes the form of a footpath on the shore and often passes through shady trees, so there is no need to worry about overheating when running. This track can also be passed by bicycle. We have more local during weekend and Sunday, if come on this day the path will be busier than normal day, you see Balinese walk with family, take out their dog. For older people, they may take slow walk, talk with others while enjoy the view of the beach. And so much more activities we can do such as Sailing, fishing, kayaking, swimming, canoeing, wind surfing, doing some water sport like jet ski, banana boat, parasailing. Other famous tourist activities is Sea Walker, if you want take boat to Nusa Penida or Lembongan island, we can catch the boat from this beach, there are so many boat company operated here. Sometime you may see a group of people practice yoga.